In September 2018, a second intermediate evaluation of the TICKLE environment was carried out at the Vlaamse Dienst Speelpleinwerk (VDS), translated as the Flemish Service for Playground Work. 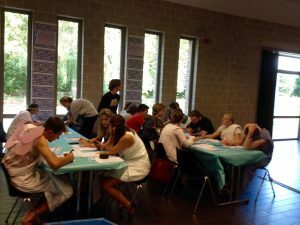 The evaluation took place during their start weekend in Oud-Turnhout. Here, a kind of city game, restricted to one street, was played. A divers set of cards with challenges was spread along the street. 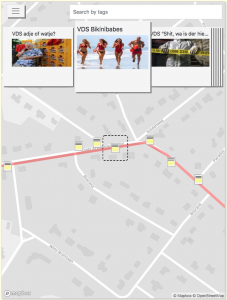 Participants had to find cards which became visible on the street map on the screen when they physically came in the vicinity of a card. These cards contained tasks and challenges with which points could be earned. Each challenge that was well executed yielded points. The aim was to collect as much points as possible. After the geo game, feedback of the participants on how to improve the TICKLE environment was asked and taken into account. We would like to thank VDS and all participants for their cooperation and feedback during this second evaluation of the TICKLE environment! 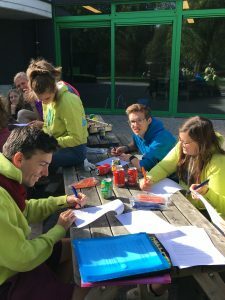 A first intermediate evaluation of the TICKLE environment took place at the Vlaamse Dienst Speelpleinwerk (VDS), translated as the Flemish Service for Playground Work. More specifically, the evaluation took place in August at the playgrounds of Bornem and Puurs. 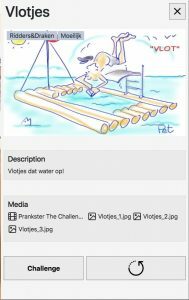 VDS was looking for a game to improve the cooperation between the animators of the playgrounds and to stimulate their creativity. 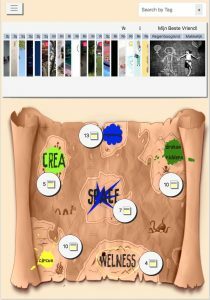 In order to do so, the TICKLE environment was used.The TICKLE environment offers a number of cards that can be collected by completing the task or challenge mentioned on the card (a sample card can be found below). Sample card (cards are in Dutch). The cards were used to give the animators assignments. All cards were placed on a treasure map (see below). The challenges were activities related to the operation of the playground. Challenges could be carried out individually, or collaboratively with other animators. The goal was to carry out the challenge/activity to the best possible and to collect as many cards as possible. Afterwards, feedback of the animators on how to improve the TICKLE environment was asked and taken into account. We would like to thank VDS for their cooperation in this first evaluation of the TICKLE environment! On October 19, 2018 Associate Professor Naraporn Chan-o-cha, spouse of the Thai Prime Minister and Vice Chair of the Distance Learning Foundation of Thailand, brought a visit to Web & Information Systems Engineering (WISE). During the visit, Prof. dr. Olga De Troyer presented an overview of the work WISE has been carrying out during the past years. Focus was put on e-learning in general and the TICKLE project in particular. 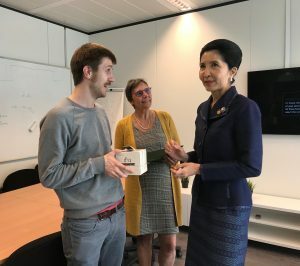 The TICKLE project, which aims for the development of an ICT playful environment to tackle school burnout in Brussels, was presented and the location-based game was introduced to Associate Professor Naraporn Chan-o-cha.